Designer Nicola Gallizia takes cues from the city’s Modernist legends, adding a contemporary twist. Lacking the outward charm and history inherent in most Italian enclaves, Milan has earned a reputation among some as the country’s least attractive city. For designer Nicola Gallizia, that’s a simple misconception. “The beauty of Milan is hidden inside its iconic homes, which not all people have the chance to see,” he says. Now, Gallizia has created a solution: Hotel Viu. 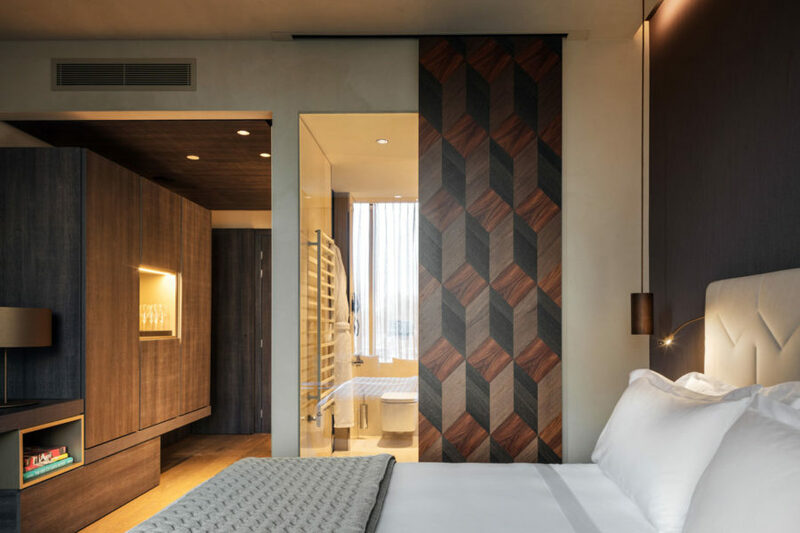 Near both Corso Como and The Duomo Square, the new, 124-room stay was envisioned in the mode of a stylish Milanese flat, awash in rich wood, muted textiles, and Molteni furniture. Gio Ponti’s classic interiors were a privileged point of inspiration, and two of his armchairs now sit in the lobby, created with special dispensation from the Gio Ponti Archives.